Motorhead were forced to cancel two appearances at the Monsters Of Rock festival in Sao Paulo, Brazil over the weekend after frontman Lemmy Kilmister fell ill on Saturday and was sent to hospital for further tests. "Monsters Of Rock regrets to inform the public that Motorhead will not be able to carry out the performance scheduled for tonight,” posted event organizers on Saturday. “The lead singer Ian 'Lemmy' Kilmister, this morning suffered a serious gastric disorder, followed by dehydration. Lemmy has already had tests and been initially medicated, but on medical orders is unable to be present." Promoters announced that Judas Priest added 30 minutes to their sets following Motorhead’s cancellation, while guitarist Phil Campbell and drummer Mikkey Dee joined Andreas Kisser and Derrick Green of Sepultura for a jam session in Lemmy’s absence on Saturday. Lemmy’s health has affected the band’s schedule with tour cancellations in recent years as he dealt with being fitted with a defibrillator because of heart problems, a 2013 haematoma (where blood collects outside of a blood vessel) and ongoing issues related to his diabetes. Motorhead’s next scheduled performance is set for Tuesday, April 28 in Curitiba, Brazil. 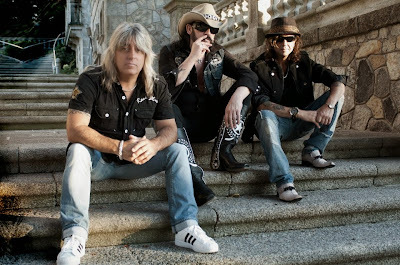 Prior to the South American shows, Motorhead were in a Los Angeles studio working on their 22nd album.